A couple of years back I decided I wanted to make a series of underwater short films illustrating the type of marine life someone could expect to see when visiting a particular destination. I didn’t want narration or a story… none of that. I wanted the natural beauty of the subjects, along with camera and lighting artistry to take center stage. Looking back to the olden days of film, the use of the word ‘Rolling’ when someone was filming always appealed to me. I pondered how I could incorporate that word into my series. That is where the name ‘Rolling in the Deep’ came from. This installment of the series focuses on the macro subjects of Komodo, Indonesia. 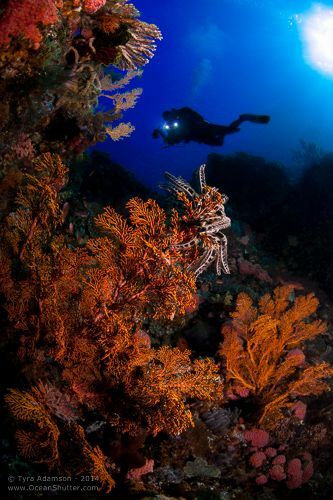 Coral Reefs are diverse underwater ecosystems. Many people think that coral is just underwater plants, when in fact they are a bunch of tiny animals forming colonies. 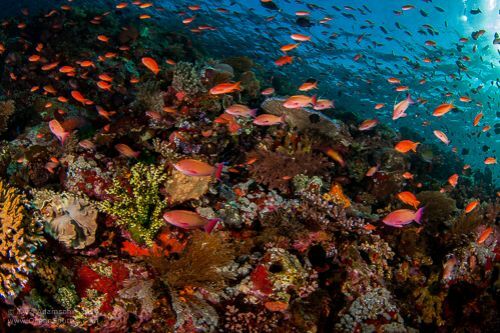 Did you know that coral reefs cover a mere .01% of our world’s oceans yet contain up to 25% of all marine species? They are crucial to overall health of the ocean. 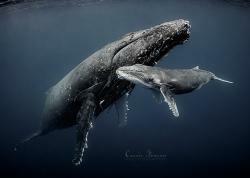 This is why conservation of these precious underwater treasures is so important. I saw some of the most pristine reefs I have ever seen while in Komodo, however, I also saw some of the most devastated coral reefs I have even seen! 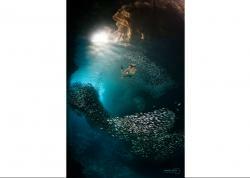 During the film you will most likely notice the beautiful and graceful Manta Rays. If you look closer, you will see a reef that has been devastated by local Indonesian dynamite fishing. Komodo has “National Marine Parks” set up, but oftentimes the laws aren’t followed and nobody is there to enforce the rules. Shooting wide-angle with a DSLR can be challenging. First of all, having enough sunlight is the key for me. I personally prefer natural light when shooting wide, and have always found lights to look strange and unnatural. This is personal preference, of course. White Balance is the other challenging thing. Whenever the light changes underwater, I change directions or ascend/descend 10 feet or so, I set a new custom white balance. I use either the sand or a white slate to get my white balance. This works the majority of the time. 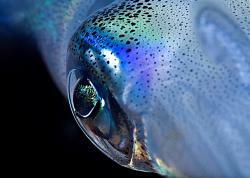 One of the negative aspects of shooting DSLRs underwater is the lack stability while shooting. DSLR housings aren’t made like traditional video camera housings, so I find the best way for me to get as smooth a shot as possible is to extend my tripod legs so that I have a wider hold on the housing (as opposed to using the housing handles). 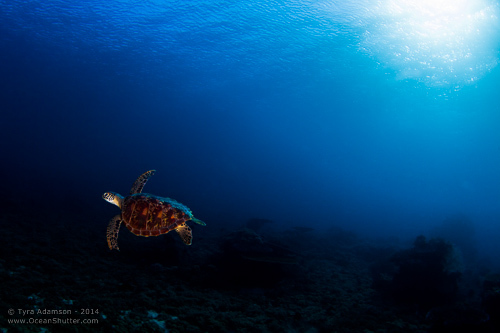 During my trip to Komodo, I was using a Canon 5d Mark II for my camera. This is a full frame camera, so combining it with a Canon 15mm fisheye lens makes for a very wide view. It can be challenging to keep unwanted things like divers, bubbles, boats, etc… out of your shot. I prefer this fisheye lens to rectilinear wide-angle zoom lenses due to the sharpness it brings. Some underwater videographers don’t like the distortion of the fisheye, however. For my tastes, I would rather a sharp image and distortion rather than the soft edges of a rectilinear wide-angle zoom lens. Again, this is all personal preference. I do not use a red filter. With a good white balance, the colors that a DSLR can provide are much better and more realistic than those recorded with a red filter. I have always found red filters to be more trouble than they are worth. They are useful for some cameras, but not ideal for DSLR video. The reefs in Komodo, Indonesia are fantastic overall! Combine that with the current and all you have to do is hit record and shoot while drift diving. 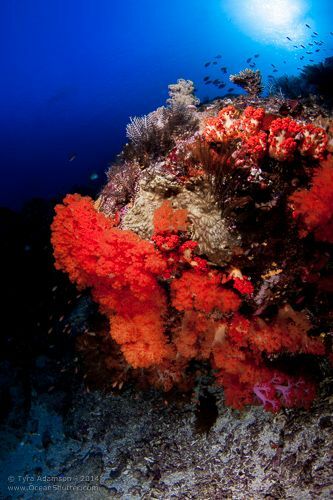 From both an underwater and topside perspective, Komodo should be on every divers bucket list. 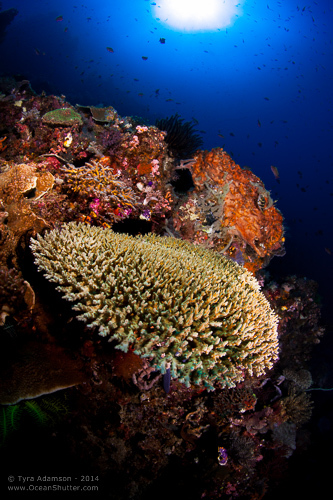 Bluewater Travel has all the info you need to book your dive trip to Komodo. Join our guided trip to Komodo in March 2015! We'll have 2 specials guests onboard with us - Aggressor owners Wayne Brown and Wayne Hasson! !